PALM SPRINGS Calif. – Game one featured the Manitoba North Stars riding a four-run fifth inning to defeat the Palm Springs Chill 6-1 on Saturday afternoon at Palm Springs Stadium. The clubbing blow came on a Nick Agosto two-RBI single with nobody out in the frame. The day began as a pitcher’s duel between Chill (3-5) starter Logan Campbell and the North Stars’ (4-3-1) Chris DeRue. Campbell cruised through four innings allowing only a solo home run to Cory Slater in the first, while striking out seven and walking one. DeRue (1-0) got the win after letting up one run on five hits in five innings with five strikeouts and no walks. The left-hander for Manitoba signed a contract early in the week to play for the Windy City ThunderBolts out of the Frontier League and is prepared to pitch professionally for the first time in his career. For DeRue, earning a professional contract was a goal he had coming into the California Winter League. Earning one near his hometown of Lake Villa, Illinois was an added bonus. The left-hander has made the most out of his experience in Palm Springs and is enjoying his time left before the season ends on February 18. Game two consisted of the Palm Springs Power scoring 12 or more runs for the third time in three days after blowing out the Canada A’s, 16-1. Cletis Avery had a banner day at the plate. The future Southern Illinois Miner reached base five times and finished 4-for-5 with a triple, a run scored and five RBI. Christopher Scalisi, who went 5-for-5 two days prior, finished 4-for-5 with a double, two runs scored and two RBI on Saturday. Left-handed starter Kyle Brown (3-0) shined in three innings of shutout work. The future Miner allowed just two hits and struck out four in the win. Scott Harkin (1-1) took the loss for Canada. On the auxiliary field, the day kicked off with a good battle between the Oregon Lumberjacks (5-3-1) and Toronto Rush (4-4), which the Lumberjacks won, 4-2. The Jacks scored early and never trailed in the game. Shortstop Arron Endres hit a two-run home run in the bottom of the first inning and third baseman Chandler Rodriguez followed that up with a solo homer of his own in the second. The Jacks added one more run in the third and didn’t score again the rest of the way, but that’s all they needed. Sam Burton started on the mound for the Jacks and worked four solid innings to get the win. Burton gave up just one run and struck out six Rush hitters, showcasing a dominant fastball and a lethal curveball. Mike Castellani earned a hold and Robert Humes picked up the save. In the loss for the Rush, right fielder Robert de Angelis reached base safely three times with a double and two walks, and catcher Kyle Stahl had two singles. Nicholas Cuckovich started for Toronto and ended up with the loss. In the second game of the day, the British Columbia Bombers (2-5-1) overpowered the Coachella Valley Snowbirds (0-9), 14-3. 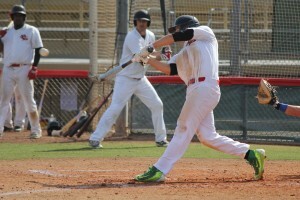 The Bombers scored seven runs in the fifth inning alone in a breakout game for their lineup. Four Bombers pitchers held the Snowbirds’ bats quiet, with starter CJ Harris getting the win. Keito Seko took the loss for the Snowbirds. The California Winter League will enjoy its only day off of the season on Sunday and will resume action on Monday. The first game at Palm Springs Stadium will consist of the Power taking on the North Stars at 10:00am. Game two will begin at 12:30 between the Bombers and Chill. Monday’s are “Locals Day” at Palm Springs Stadium. Those with a valid Coachella Valley ID will be admitted for just $3. Those not in attendance can listen to the broadcast live at CaliforniaWinterLeague.com.